Introducing our first digital recording monitors to include Wi-Fi. With the added ability to stream and/or record inspections to the latest iOS or Android devices. Enabling fast, efficient results. 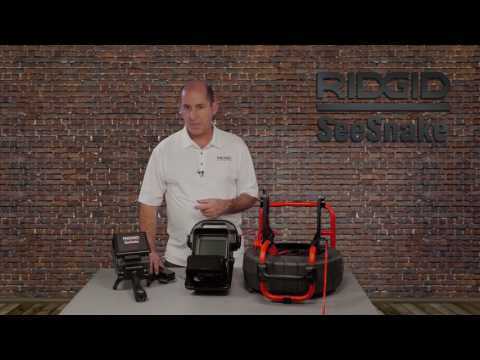 Transport and Storage - The CS6x mounts to the SeeSnake Max rM200 docking handle for easy transport and storage. Power Source 18V Advanced Lithium Battery (optional) or an AC Adapter. SeeSnake® CS6x Digital Recording Monitor with Wi-Fi is rated 1.0 out of 5 by 2. Rated 1 out of 5 by JDez from Extremely Disappointed! I Purchased the cs6x and the Rm200 camera system and after useing it twice it is already at the repair shop. I puchased many ridgid products for my business threw the years and this purchase is a Huge Disapointment! Rated 1 out of 5 by Stubabe from Cheap breaks often Have the repair center on speed dial due to constantly breaking.